It is 6AM as the morning sun reappears from the east; its rays bounce between sweeping skyscrapers, meander through brownstone windows, and settle on sidewalks and streets. Sunrises in Long Island City must be seen to be believed, and residents of this neighborhood are ever-grateful for this daily affirmation of warmth and light. One such resident, Modern Spaces CEO and President Eric Benaim, rises at this hour to spend some quality time with his family each and every day – another type of sunshine. He usually departs on foot for Modern Spaces around 9AM. Long Island City’s walkability is one perk among many for those who live and work there, and Eric values this element of the LIC lifestyle very strongly. He often improvises new routes to keep things fresh and see as much of the neighborhood as he can. Eric always enjoys meeting new people along the way and chatting with his neighbors, including an elderly woman who occasionally needs help taking out the trash; Eric, of course, always obliges. On the way to Modern Spaces, Eric makes a point of stopping by Pantry, a farm-to-table cafe in Court Square, for a quick coffee. To Eric, Court Square is a microcosm of what makes Long Island City great, as a nexus of transportation, commerce, and culture. He’s particularly font of the small-town, “Main Street” feel of Vernon Boulevard. For those new to the neighborhood, Eric feels that Court Square and Vernon Boulevard make for an ideal introduction to LIC, along with the waterfront. His time at Modern Spaces’ Jackson and Vernon offices are spent meeting with the most knowledgeable real estate professionals around: Modern Spaces’ local agents and marketing teams, as well as their developer clients. 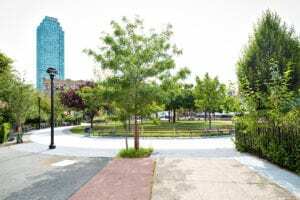 Staying abreast of Long Island City’s new developments and rapidly-evolving real estate landscape is a key element of Modern Spaces’ competitive advantage. Eric often meets with community organizations as well, such as the LIC Partnership; Modern Spaces will co-host this year’s LIC Summit, a brainstorming session featuring panel discussions. This year’s theme will be “America’s Fastest-Growing Neighborhood”, a title that Long Island City has earned by balancing growth with community. Lunch brings a familiar challenge for Long Island City residents: deciding between countless world-class restaurants. Two of Eric’s go-to lunch spots are Vernon Boulevard standouts: Spice for Thai food and Slice for pizza, pasta, and other Italian standbys. He also recommends Gantry Bar and Restaurant, another fun venue on Vernon with a backyard garden. While everyone has their favorite local haunts, and cherished weekday routines, for Eric, each day is truly unique, in the spirit of Long Island City’s “live, work, and play” atmosphere, afforded by the neighborhood’s variety and dynamism. LIC’s redeveloped industrial area has seen tremendous change over the past decade, with luxury apartments now sky-high in demand (as well as height). Trendy bars, unique restaurants, and original art galleries continue to pop up betwixt new LIC condos, driving young professionals, artists, and everyone in between to the booming locale. As owner of his own successful real estate brokerage firm, and a longtime resident of Long Island City, Benaim has witnessed its evolution firsthand, and in a sense has experienced something similar as Modern Spaces has grown along with the neighborhood. While his affection for historic LIC icons like the waterfront’s Pepsi Cola sign has not waned, he has grown to love the burgeoning cultural scene, too. Perhaps this healthy respect for old and new explains Eric’s “happy place”, so to speak, which is an institution that is relatively new on the scene, but well on its way to historic status: “MoMA PS1. It’s a great place to walk around and get some alone time.” It’s fitting that even when he is craving some well-earned “me time,” Benaim chooses to renew himself in the culture and public life of his beloved LIC. At Modern Spaces, we believe you should love your place. To find your next home, check out our listings, learn more about our dedicated agents, or contact us today.